Thoughts: This is the correct sticker for the helmet to the right, it's just that the person who bought it put the sticker on the wrong colored helmet. Dates used: Mid-1960's, maybe 1964? Thoughts: I thought it had to be a mistake until I found a picture of Curt Flood in a hat that looked like this. I'm still trying to figure out the years. This is by far one of my best finds. Thoughts: Just a really bizarre helmet. I haven't decided yet if the strap inside is manufactured or rigged by somebody, but hey that sticker is different and that means this helmet is unique. Thoughts: In 1964 the Cards wore red caps with a navy STL outlined in white for both helmets and caps. The helmet to the right is a Bob Uecker helmet from '65. Thoughts: Another strange helmet. This one has a safety sticker in it and that is it. There are no identifying features as for manufacturer. A great find! Thoughts: In 1965, the Cards changed to a red cap with STL in white and a navy outline. However, this helmet being from Sport Products means that it was made in 1969 or close to that time. The helmet to the right is a Roger Maris helmet from '67. Thoughts: There are four air holes on the top, not two, and the Adjustrap is white. If you look closely, the bill of this helmets is also much wider. 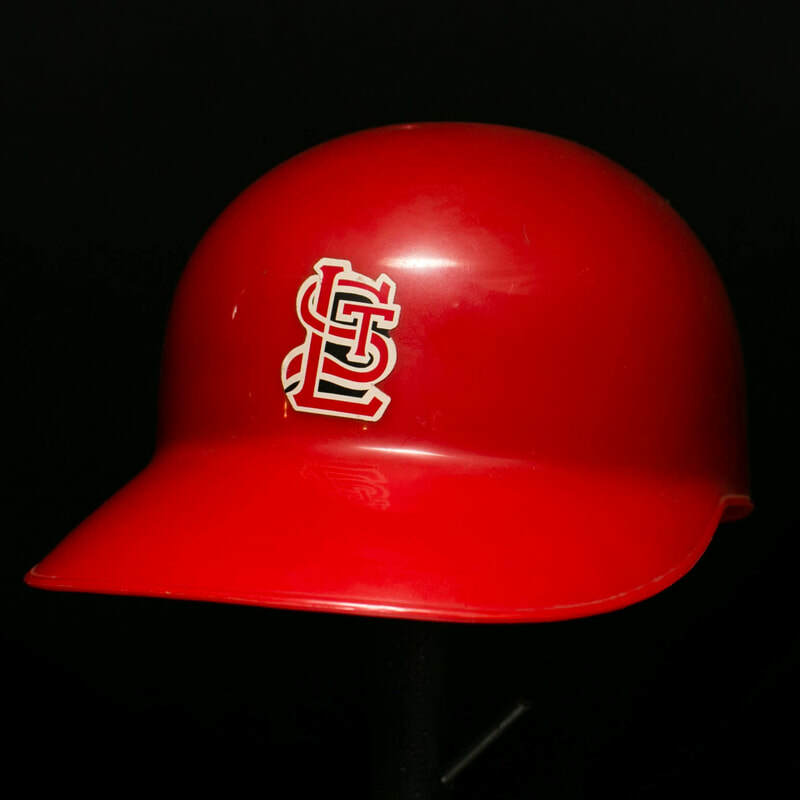 On this particular helmet, the "STL" does not have a black outline around it. In 1964, while retaining their blue caps for road games, the Cardinals changed their home caps to all red with a white interlocking STL with no outline. Dates used: 1965 to 1990? Thoughts: Same as above, except this helmet is older due to having foam padding and a sticker for the logo. Thoughts: Just a duck-billed version of the helmet below. Dates used: 1991 to present? think it was in 1998.
use to wear hats and helmets like this from 1956 to 1964 except the logo would have had fatter letters like the first helmet on this page. just a promotional item. This was the Cards primary logo from 1967-1997.
just a promotional item. Was this a St. Louis Cardinals helmet or a Louisville Cardinals helmet? Thoughts: I just thought this was an interesting helmet because somebody actually used a cloth sticker. helmets didn't became mandatory in the National League until 1955. This helmet was manufactured by Fotoball as a throwback helmet in 2004. Thoughts: A Cancer Awareness promotional helmet. I'm not for sure what year this was available.